Update 2018: Covecastles is closed. 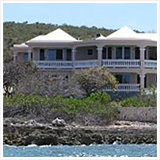 Anguilla's high-end villa resort, Covecastles lines the western side of Shoal Bay West, a large, gently curved bay with soft, white sand on the southwestern side of Anguilla. 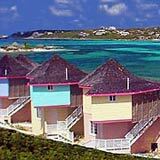 Shoal Bay West is also the home to Blue Waters Beach Apartments and Trattoria Tramonto Italian Restaurant. 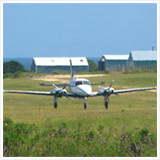 As you pass the large portion of the West End Salt Pond on your left, look right for a white entryway. 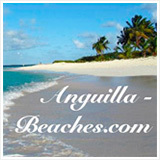 Compared to some other larger Anguilla resorts, the sign is understated and modest. 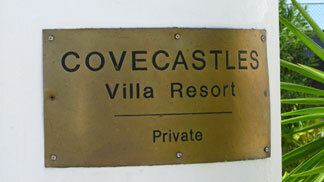 A small gold-toned plaque on the white entryway reads "Covecastles Villa Resort". If you are staying in a villa, drive on through, right up to your home away from home on your splendidly, sparkling, turquoise water beach. Granted, this entry is probably the least dramatic way to see Covecastles for the first time. They seem to stand at attention, perfectly spaced, as if spotting something interesting out at sea. If you are to see them initially by entering the resort by the main entrance, you will miss a first impression of what sets Covecastles apart from the rest. When viewed from the beach, you see they are truly unique. 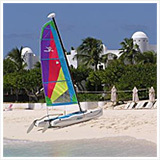 There is plenty more that makes this Anguilla villa resort unique... Let's find out what that is! 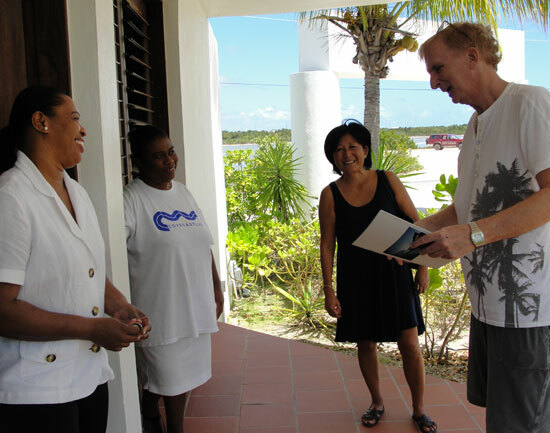 We parked and walked to the office to meet Patricia, the assistant manager of Covecastles. She was as warm and welcoming as can be. As we stood outside of the office on the porch, we noticed that a few people were enjoying the tennis courts. They are located right next to the office. The gardens are nice, with more of a wild, nature feeling than a manicured one. I asked Patricia how long Covecastles had been there. She replied, "Since the '80s." 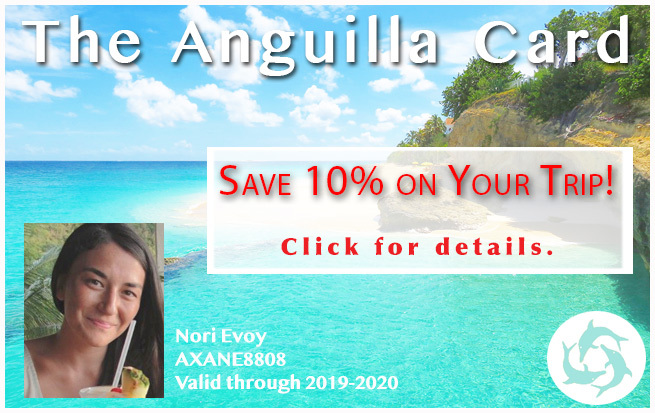 That is time enough to see its share of changes in Anguilla. It's impressive when a business is able to sustain in a rapidly changing environment and it seems at a quick glance that Covecastles has. 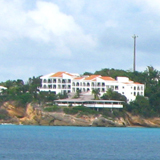 Its age makes it one of the older resorts on the island. While we were chatting at the office, Judy pulled up on a golf cart ready to drive us out to villa #8, which is also called "The Pavilion". 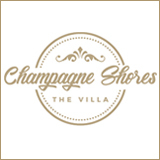 The Pavilion is a four bedroom villa with a private pool. 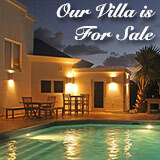 It also the villa farthest west and therefore the end of the property. 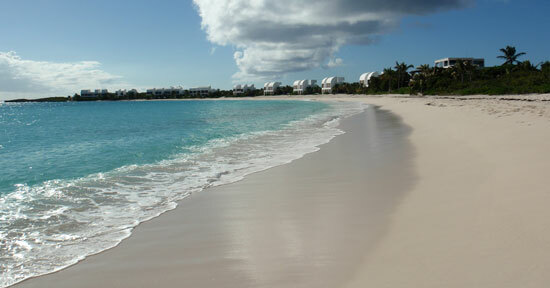 It sits on a separate section of Shoal Bay West and has a wading and snorkeling beach out front. 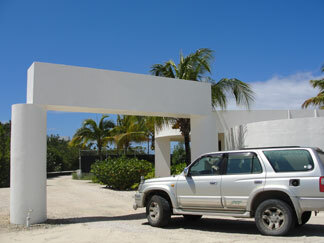 On the way out to The Pavilion we notice that each villa has its own parking area and walkway. We all found this to be a bonus, rather than a larger general lot, and it is convenient. Each walkway was carved through the green seagrape trees and plants that give a nice tropical feel to your entrance. We arrive at The Pavilion and all seem to have our breath interrupted by the view as we peer straight through the villa beyond the large rattan sofas and expansive dinner table. It's easy to get comfy here quickly! 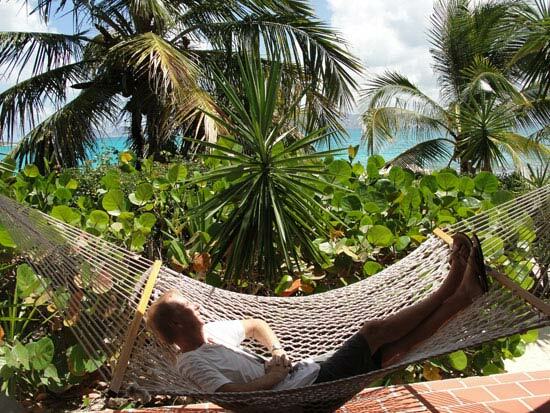 Our eyes rest on a combination of wispy palm trees, the baby blue water from the private pool, the intense turquoise of the Caribbean sea, the large puffy white clouds in the sky, and the dark pieces of outer cays in the distance. That is one long pool! 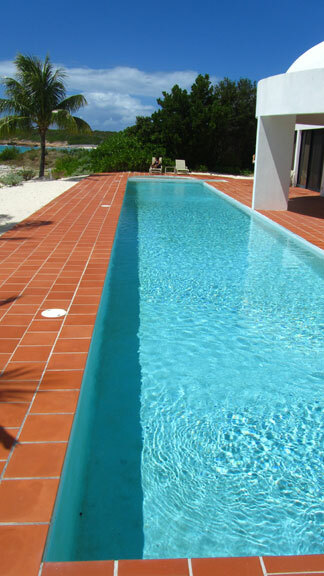 There are not one, but two, hot tubs capping each end of the long (great for laps) pool! My goodness, is it time for a cold cocktail and a nap on the porch yet? Not yet, first we begin exploring the main living area which includes a living room, open to a dining area, and the kitchen. Overall the decor is neutral tones and the light in the room mid-day is all natural and lovely. The furniture in the living room provides enough seating for at least 5 people, easily. I liked the shapes of the throw pillows on the sofa... They were large and round. We did notice that however very clean and comfortable, the upholstery had some slight pills and wear in some areas. Next we move on to the two bedrooms that have a sea view. 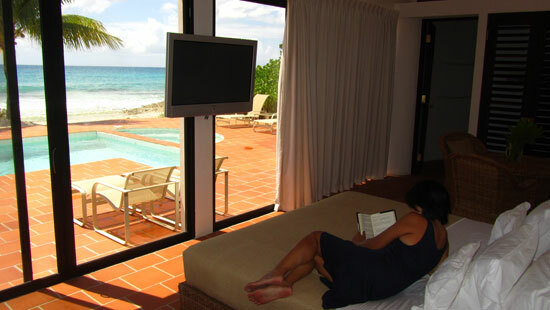 The King bedroom is equipped with a decent sized flat screen television mounted directly at the foot of the bed, on the wall that provides incredible floor to ceiling views of Shoal Bay East. It also had a nice table and chairs between the bed and closet which was next to some built-in drawers and cabinet. The furniture gave the room a subtle smell of rattan... Another reminder of the tropics. We walked past the bed and into the bathroom. We thought the bathroom was simple, clean and updated. The second ocean front bedroom (which could convert from a King to two twin beds) had a smaller flat screen television sitting on the dresser. Both had air-conditioning units mounted on the wall. Upon checking the two non-sea view bedrooms, we found them to be similar to the ocean-view bedrooms, minus the spectacular view. Ken pointed out that it would be nice if every bedroom could have a view so no one is "stuck" with the less majestic bedroom. These bedrooms had full beds, seating areas, their own televisions (a little smaller) and air-conditioning units as well. Ken going for a cold beverage! What I found special about this villa was the open living space, complete with large bulbous skylight and the incredible views. The natural light was magnificent due to all of the windows. The large dining area, which seated six people, was inviting and the table setting was attractive. I found the kitchen to be interesting, it was long and skinny. I told Janice and Ken, it's not suited to have "too many cooks in the kitchen," which I tend to like if I'm the one cooking. The view at the end of the long "hall of kitchen" is a winner! Judy took us back toward the east and on to Villa #5. 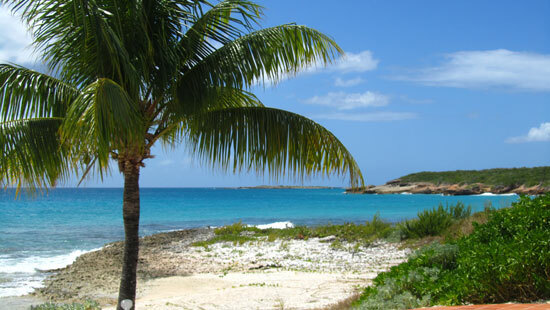 On our way, we asked Judy where Denzel Washington stays when he comes to Anguilla. "Villa #6," she replied. For all we knew, he could have been there while we were touring! The place is very private considering how open it all feels. It seems you wouldn't see a soul unless you pass them on the beach. 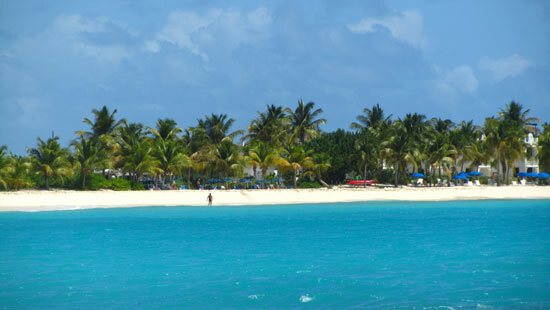 No wonder why celebrities continue to feel relaxed and comfortable in Anguilla. A beautiful flower vine has grown up the wall of Villa #5. It was beautiful in contrast to the stark white wall. Villa #5 is already looking good and we aren't even inside yet! 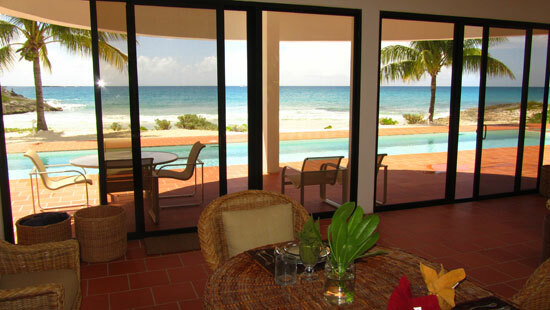 This villa was also a 4 bedroom but is set up in a different way. It is 2 stories and does not have a private pool. That being the case, Janice and I headed straight for the beach to see what the swimming would be like. You step right off of the porch and on to the sand. 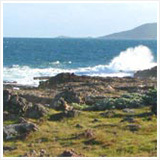 Walk about 8 large paces and you are on the main stretch of Shoal Bay West. St. Martin in the distance, Anguillita to your right. Ahhhh. Needless to say were not disappointed. While Shoal Bay West has its patches of rocks (which are great for snorkeling) the bulk of the beach is powder white sand and silky expanses under the sea too. This villa's furnishings and amenities are very similar to The Pavilion. The layout is a bit less "open" and therefore feels a little less spacious. The living area is ocean front with the kitchen on the back side of the villa. 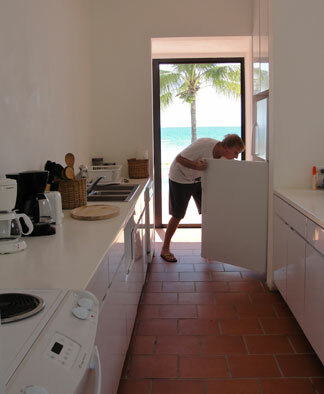 This kitchen was no "hall of kitchen", it was a decent sized square kitchen with everything you might need. Ken in one of ocean view bedrooms. I caught his flash! The curved and open stairway leads up from the kitchen entry to the bedrooms which are all on the second floor. As with The Pavilion, two bedrooms are ocean view and two are not. 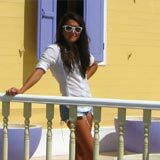 I noted to Janice I liked the rustic Anguilla decor of a small model racing boat and the montage of thatch brooms. Someone who appreciates Anguilla's culture might prefer a villa like this as opposed to a more sterile and modern Viceroy-type accommodation. 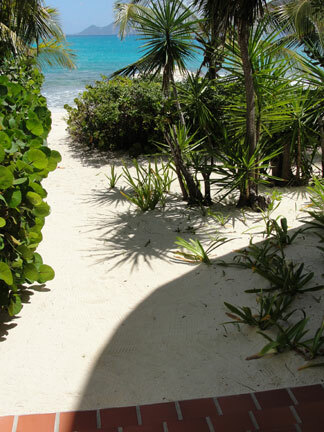 Covecastles certainly has a classic Caribbean appeal. 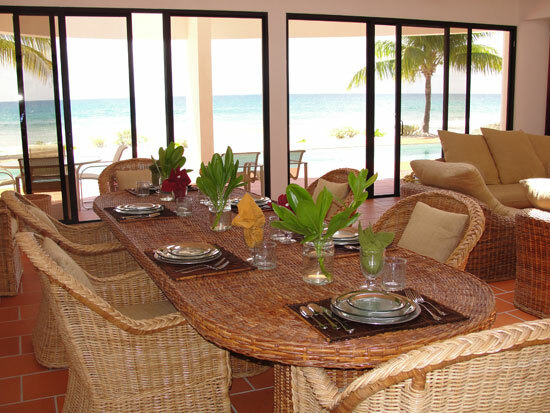 For example, the tables were wicker/rattan vs. glass top that you find at Viceroy. Judy drove us back to the office where we thanked she and Patricia for the opportunity to see Covecastles up close, and thanked them for their kind hospitality. Update 2015: Covecastles Restaurant is open again! Genius Executive Chef Marc Alvarez has re-opened Covecastles Restaurant to great acclaim. More on Covecastles Restaurant here. We asked Judy about the Covecastles restaurant that used to be in full operation. You can read about Cove Castles' former restaurant here. She told us that it is still very much in use, just not for public dining. The kitchen is now used for room service. We took a look at the menus for breakfast, lunch, and dinner. My mouth started watering. Breakfast and lunch are treated as room service. Dinner can be catered in your villa. Breakfast includes eggs, breakfast meats, yogurt, cereal, pancakes, and even cheese plate. The lunch menu is where things start to sound scrumptious! Lunch includes options such as caprese salad, pumpkin soup, burgers, crayfish pasta, grilled chicken salad, pan-seared snapper and a tomato pie with fresh greens. The dessert list had me curious. Here are a few options: chocolate pepper cake (hmmm! ), creme brulee, fresh fruit, and key lime pie. Dinner catering includes choices of soup or salad, main entrees such as grilled crayfish with mashed potato, blackened snapper with risotto, and beef tenderloin with grilled vegetables. Update 2016: Since this article was written, Covecastles management has breathed new life into the property. Update coming soon! As we drove away from Covecastles, Ken made some interesting points. He noted the age of Covecastles and said that higher-end clientele spending taking on that level of rates may expect a little more. View of Anguillita from Covecastles. Nice views! Great to walk out on to the beach and over to Trattoria Tramonto. The bedrooms should all have ocean views. Great, close, private parking area. The place needs to be updated for the rate that is being charged. Overall, liked it and thought it was comfortable. Loved the pool and hot tub option. Agreed with Ken that it could use some updating but noted how clean it was. Compared its age to Malliouhana. Understands Ken's point on expectation for price. Great place for families wanting to spend time together. Noticed the worn upholstery but liked the comfortable, less-intimidating overall feel of it. Not too pretentious. The Popular Opinion? 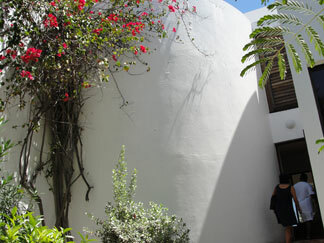 Several travelers have fallen in love with Covecastles for its location, privacy, and classic decor. 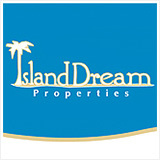 Drawbacks that have been expressed include wear on the property (a need for updating), and a need for improved service. Despite its age, it still is a jewel of a place to vacation. It is in a great location. It is quiet. It is private. It has its beauty. After all, there aren't too many luxurious spots where you can take in both St. Martin and Anguillita, all from a perfect Anguilla beach!